Shipping: 1. Free Email fulfilment (registration code and download link will be sent to your email address). No charges for shipping. 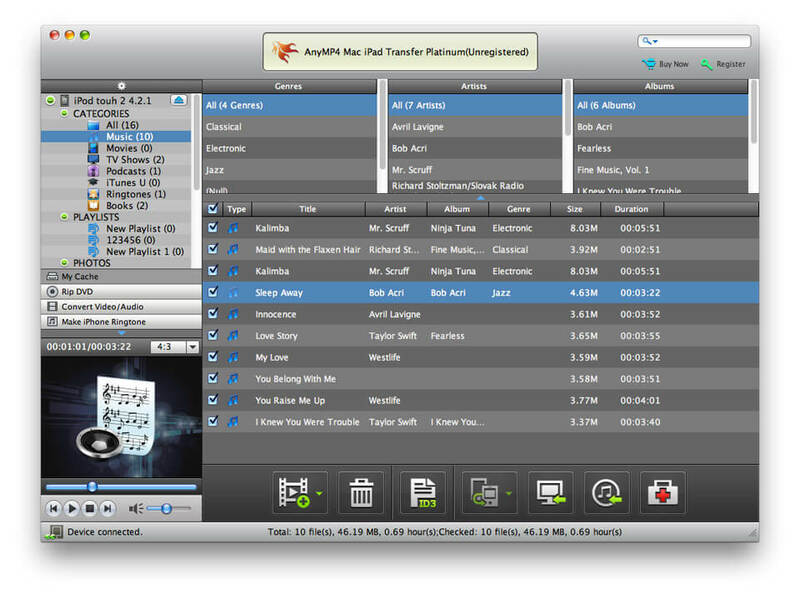 AnyMP4 Mac iPad Transfer Platinum is the most wonderful iPad transferring software, which is designed for iPad users. Besides, it can help users export iPad files to Mac. Also, it supports importing videos, music and image files from Mac to iPad. So users can enjoy the interesting movies, songs and photos on iPad conveniently. Also, this wonderful Mac iPad Transfer Platinum allows users to convert both DVD and video files to iPad compatible video formats on Mac. And it can help you customize the output files with its powerful video editing features. Also it supports all versions of iPad, iPhone and iPod and it can work well with the iOS 7 and supports the latest iPhone 5S and 5C. AnyMP4 iPad Transfer for Mac enables users to export iPad files, like music, movie, pictures, TV shows, Podcast, iTunes U, eBooks, Camera Roll, voice memos, camera shot, etc. to Mac. Also users can add local ePub, PDF, audio, video and image files to iPad. Besides, it supports to sync iPad files to iTunes for backup. Moreover, this program can help users to backup iPhone SMS and Contacts on Mac. This iPad Transfer for Mac also has the ability to rip any DVD to iPad compatible video and audio formats. Then users can enjoy the latest DVD movies on iPad conveniently. You can also convert almost all popular video files to iPad MP4, MOV, H.264, etc. video for enjoyment. Apart from that, it supports all Apple version devices like iPad 4, iPad mini, iPhone 5C/5S, iPod and the newest iOS 7. This Mac iPad Transfer is able to edit the video effect such as trimming, cropping, watermarking, merging several DVD chapters/titles or videos together, etc. You can also use it to make iPhone ringtone. Cucusoft DVD to iPod Converter 6.02 by Cucusoft Inc.
Cucusoft DVD to iPod Converter is the easiest-to-use DVD to iPod converter. Cucusoft DVD to Zune Converter 6.02 by Cucusoft Inc.
Cucusoft DVD to Zune Converter is the easiest-to-use DVD to Zune converter. A DVD to AVI/WMV/iPod/PSP/MP4/3GP/Zune/MPEG/FLV/VCD/SVCD/WAV backup software. Convert MTS and other popular video/audio files to any video or audio format. Convert MTS/M2TS/TS video to any MP4, MKV, WMV, MOV, M4V, FLV, AVI on Mac. Convert any latest DVD movie to iPhone compatible video and audio format.